'Pinched nerve' is a phrase used to describe symptoms of pain, numbness or weakness caused by compression of a nerve. What is most characteristic of pinched nerves is that the pain or numbness radiates away from the site where the compression occurs. To correct the problem detailed knowledge of the nervous system, skeleton and muscles is essential. 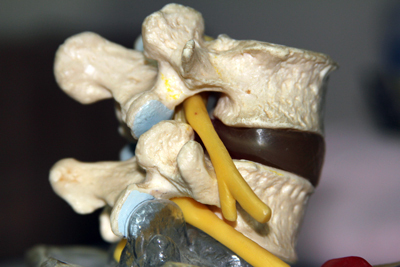 Although a nerve can be compressed anywhere along its length, 'pinched nerve' usually refers to a nerve compressed as it passes through a small opening in the spine, called a foramen. The specific pattern of pain or numbness indicates where the nerve has been compressed. Pain radiating down the arm, usually with difficulty turning the head, points to the neck. Suspect a pinched nerveif your symptoms increase when you bend your head back and toward the side of pain. Sharp pain in the rib area when breathing or twisting indicates a pinched nerve in the mid back. Pain radiating down one leg is the most characteristic symptom of a pinched nerve in the low back. These symptoms can have other causes as well. Suspect a pinched nerve if bending forward while keeping your symptomatic leg straight increases your pain. Nerve compression is a serious condition. The following advice is to help you temporarily until you can get appropriate treatment. The best thing you can do to manage the pain of nerve compression is to apply cold to the site of the compression. Many times this will not be the site of the pain. The simplest way to apply cold is to mix ice and water in a waterproof bag and put it on the site where the nerve is compressed. The water guarantees that the contact will be good and the ice keeps the water very cold. Apply the cold for 15 minutes, then remove for at least 15 minutes. Repeat as often as needed. There are three major types of treatment for a pinched nerve: medication, manipulation and surgery. They each have advantages and disadvantage. Medication is the easiest. In fact you can buy over the counter medication and in effect treat yourself. If you go to the ER or your MD, they will usually prescribe a combination of three medications: an anti-inflammatory, a muscle relaxer and a pain killer (often a narcotic.) This approach may be described as 'pop and pray.' You 'pop' the pills and pray that your body figures out how to re-balance itself, at least enough to stop the pain. Many of the patients I have seen have first tried medication, without success. The disadvantage to the use of medication is that it is reactive and does not place any importance on understanding why the body hurt in the first place. Pain is seen as the problem not as the message that there is a problem. Whereas medication focuses on managing the chemical reaction created when a nerve is compressed and irritated, both surgery and manipulation address the physical component of nerve compression. Manipulation focuses on restoring optimal function. In my office I use a combination of acupressure, myofascial therapy and chiropractic manipulation to restore proper muscle tone and joint alignment. Surgery on the other hand focuses on removing and repairing damaged tissue. These two approaches are more complementary than opposed to one another. Manipulation is obviously more appropriate in conditons with less physical damage. The reverse is true of surgery. The danger to the patient comes when manipulation is not considered and the only alternatives suggested are medication and, if that doesn't work, surgery. A 'pinched nerves' is a serious condition. Most pinched nerves are caused by imbalance of muscle tone and/or misalignment of joints. If not corrected muscle imbalance and restricted joint mobility can lead to joint degeneration where the material of the body is damaged. A bulging disc is an example of this. Medication and surgery are both reactive treatments. Escape from pain is the primary motivation for the use of medication. Surgery is a reaction to the deterioration of the body and the resulting chronic pain. Manipulation can restore proper use before tissue damage occurs and stop or slow the progresssion of the tissue damage which can lead to nerve compression. For this reason manipulation is a proactive therapy and has health as its goal. An additional benefit is that the experience of physical manipulation gives the patient an opportunity to become more aware of how his or her body operates and what can be done to become healthier, not just less symptomatic.